On ligand binding, forms a receptor complex consisting of two type II and two type I transmembrane serine/threonine kinases. Type II receptors phosphorylate and activate type I receptors which autophosphorylate, then bind and activate SMAD transcriptional regulators. Receptor for BMP-2 and BMP-4. Positively regulates chondrocyte differentiation through GDF5 interaction. 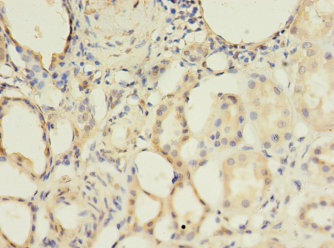 BMPR1A Polyclonal Antibody. Unconjugated. Raised in: Rabbit.